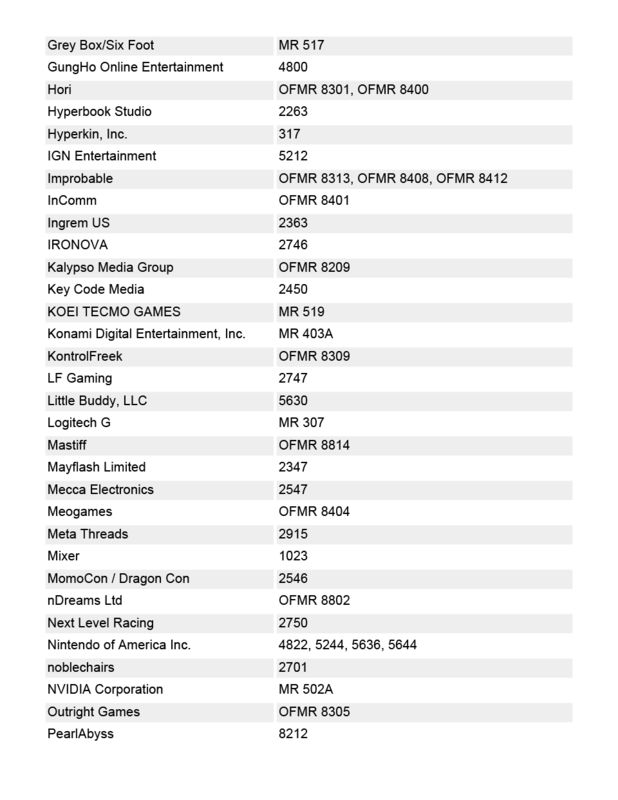 Disclaimer: The materials contained in this post, namely image representations of E3 2018 target maps, have been through legal means obtained via https://ordering.ges.com/022601156/targetmaps. 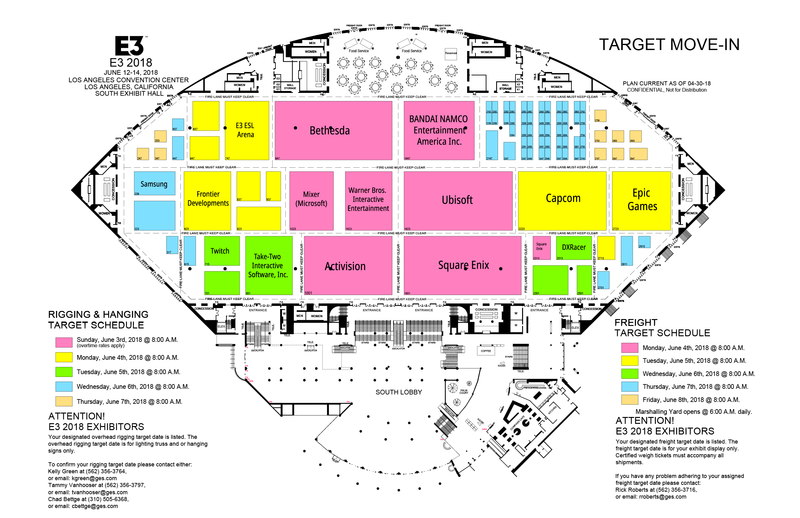 On May 05, 2018, target floor plans for E3 2018 were made available for public view by ESA/GES (event planning and marketing partner) via the Expresso by GES service at https://ordering.ges.com/022601156/targetmaps. For some time, access to these target maps was via direct communication with show management, but the maps have as of today been made available for download, and no account/login on Expresso via GES is required. 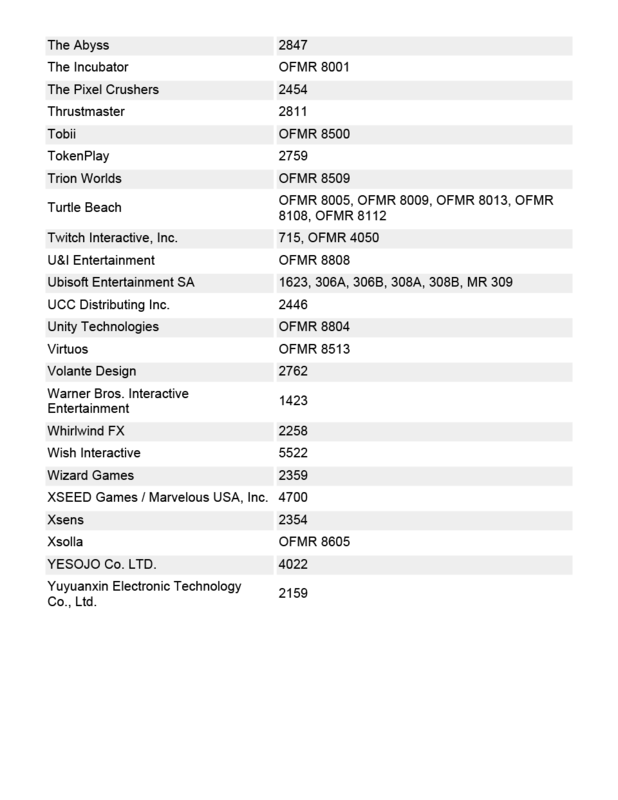 These target maps do not directly show which company belongs to which booth, but I have cross-referenced through a separate booth list (available via https://mp1630k065.mapyourshow.com/7_0/search.cfm, provided later in this post) and marked select booths with companies. At this point of time I do not have access to booth size data. The floor plans do not differ greatly from those I posted earlier this year. Some booths have yet to be assigned companies. When will the maps of the show floor be available? 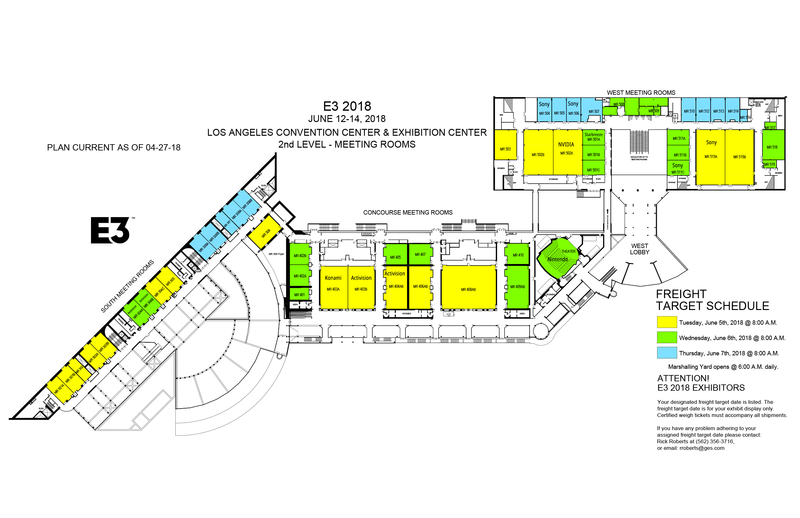 E3 2018 floor plans will be available in May. Please continue to check back. 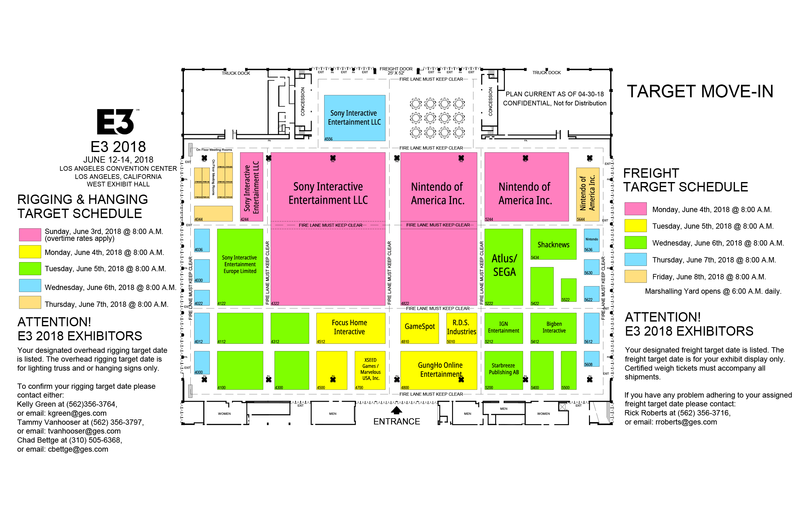 Wow, Sony & Nintendo have a lot of booth space. Is Microsoft going to have any presence at the show? Am I blind or ...where is MS? I believe Microsoft is doing their stuff in another building like EA does, right? MS has their own space in the Microsoft Theatre across the street. They have a lesser booth in South Hall, it's marked Mixer. That "Fire lane" publisher must be important, center of the stage at both Sony and Nintendo. Is MS doing something similiar to EA, where they have their own place? MS has it's own theater. SE have the biggest 3rd party boost, it can't just be Tomb Raider. 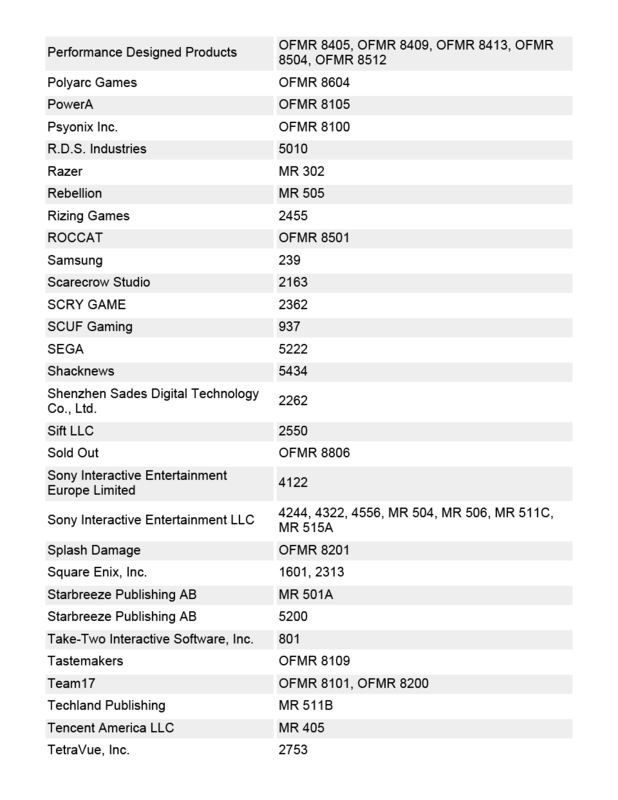 Sooo, CDPR only got MRs, meaning that the rumours about a Cp2077 press demo might just be true. That Square Enix booth! FF7R confirmed. It's going to be a huge E3 for Sony. Looks at all that space for Kingdom Hearts III. Mixer? Hope it's an open bar! Does booth size mean anything ever? Are people serious with the “where’s MS at?”? So how hard is it to sneak into one of these events? 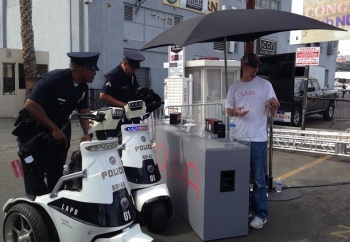 It worked great for Ouya with their own place outside the E3 conventional center. Yes. I seriously didn't know. I haven't been following MS E3 plans. Last year it didn't. Content was thin imo. Or, you know, they don't want to troll and just ask a serious question because 'they aren't up on current events'. Not necessarily. At least not when it comes to new games being announced. Might just be for demos of already announced games. Sony got a lot of those, right? MS must have a pretty interesting show planned to have it's own theater. I mean plenty of people troll MS so it’s completely valid to wonder people’s intentions , since we’ve known they had their own building for awhile. 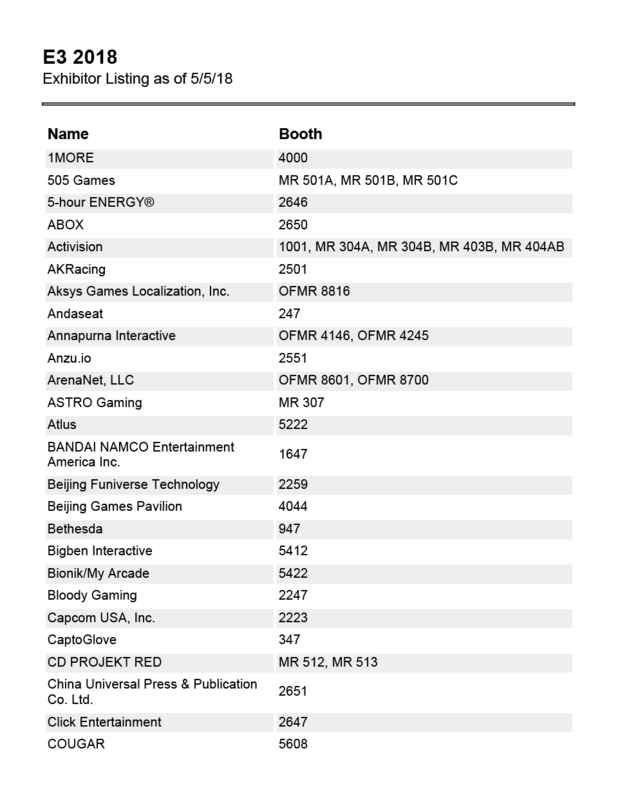 Man, Capcom's floor space is only behind Sony, Nintendo, Square Enix, Ubi and Bethesda in size. All that floor space for DMCV. Theres no need to be like that. Not everyone knows Microsoft's E3 plans. There's way more interest in Xbox than Ouya ever had. I think they will be fine. So many meeting rooms for Sony. Probably going to show off PS5 plans behind the scenes. Does FromSoft/Kadokawa not having a meeting room mean that they have a deal with a publisher in place for Shadows Die Twice...? Or they just haven't reserved one yet? At E3 2014, they showed off Bloodborne gameplay behind closed doors. They did the same for DS3 in 2015. What’s with all the MS talk? Are they hostning something by themsleves? Isn't this is like the same amount of booth space they always have? Kinda a bummer I expect to miss E3 this time... This year's E3 will probably be a lotta fun. 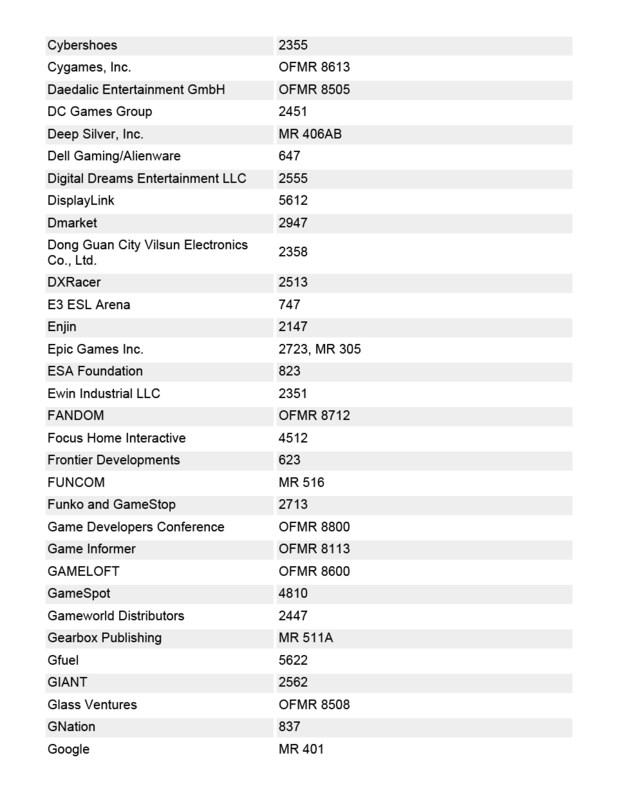 Microsoft's presence will be on the Microsoft Theater across the street from the LACC, but unlike EA, their showing is still part of the ESA program for E3. Cant wait to see Nintendo's Smash themed booth (assuming that is what they go for). Does FromSoft/Kadokawa not having a meeting room mean that they have a deal with a publisher in place for Shadows Die Twice...? Or they just haven't reserved one yet? At E3 2014, they showed off Bloodborne gameplay behind closed doors. They did the same for DS3 in 2016. You meant DS3 in 2015? It came out in April 2016. Dang! Looking so good. I absolutely cannot wait! Now all Sony needs to do is announce their E3 plans. I hope they do another E3 experience in theaters!